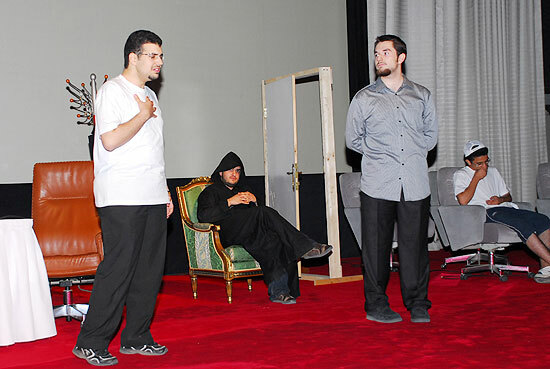 The Drama Club at Alfaisal University, produced a short play, entitled ‘The Cloak’ which had its first showing at The King Faisal Foundation Auditorium, on 26, May 2010. 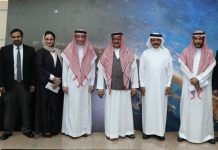 Present at the plays first showing was HH Prince Bandar Al Saud, the university’s Chairman of Executive Committee, & Member of Board of Trustee as well as faculty, students and their families. The plot of ‘The Cloak” revolves around a student, his family and friends and discusses current problems and issues affecting the youth in our society in a symbolic, sarcastic, comic and somewhat tragic fashion. suitable for the culture and value for the Saudi Society. 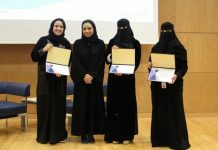 Bara AlMakadama stated, “The Drama Club`s message is to go out to revolutionize the concept of arts at Alfaisal university and hopefully soon in the community, maintaining the values that we stand for, while reaching the highest levels of artistic performances (insha’ Allah)”. fun. This was the club`s first project, which was sponsored by HRH Mohammad bin Khaled Al Abdullah Al Faisal Al Saud, President of AlFaisaliah Group. The witnessed success of this play equals the success of the students of Alfaisal showing that they can create art at a level unprecedented in the Kingdome of Saudi Arabia before. Next articleAlfaisal Med Student Discovers Yet Another Error in Grays Anatomy for Students!